Starting with a drawing in 1926, Magritte used the pipe in a number of his paintings but the best known version of the “pipe” is in the Los Angeles County Museum of Art. The painting is medium sized, carefully rendered in tones of browns. As was the usual case with Magritte, paint is smoothly applied to neuter its expressive qualities and to foreground the concern with the relationship between language and perceived “reality.” A wooden pipe with curved stem floats unaided against a café au lait background, isolated except for a carefully executed sentence “Ceci n’est pas une pipe” placed underneath the pipe. Except for the “not,” the painting is a mirror image of a schoolbook with images labeled with the attendant words. With one word, Magritte undermined the metaphysical connection, assumed by Plato, that held between words and things. Magritte also severed the “pointing” gesture of the word “this” which now has an ambiguous referent: to what does “this” refer–the pipe, the canvas, the sentence itself? The themes Magritte explored on canvas were deliberately “disorientating” and showed a fascination with visual non sequiturs and heterotopias. The term heterotopia in medical terms means the displacement of an organ from its accustomed place. In art, Magritte displaced part of one body and relocated it to another body, such as his carrot-bottle, his fish-human, with disconcerting results. To be clear, the union of fish and female is not metamorphosis but a forced fusion that is fixed and arbitrary. In The Order of Things, Foucault refers to the “heterotopia,” or a place where multiplicities co-existed. The heterotopia was produced by linking together that which was “incongruous” producing an even worse kind of disorder. All the possible orders exist separately and simultaneously and become an lawless and uncharted dimension, called the heteroclite. Things are laid, placed, arranged in sites, and it is too difficult to find a common ground for them all. This concept of “ensemble” is not unlike Benjamin’s “allegory” in the sense of assemblage, but unlike the allegory, the heteroclite resists unitary meaning. In contrast to a utopia, an untroubled region, the heterotopia is disturbing and impossible to name, thus contesting the possibility of language. What Magritte presented to the viewer was an unreconcilable contradiction that rendered language dysfunctional. Both Foucault and Magritte critique language and agree with Ferdinand de Saussure that signs are arbitrary, circumstantial, and conventional. In contrast to classical painting’s attempt to identify scenes or images with models that inspired them, Magritte sought to banish resemblance by employing familiar images whose recognizabiltiy would be subverted. He explored the secret linguistic element in painting: “This painted image is that thing,” by employing familiar images whose recognizability is to be subverted. Taking up the anti-linguistic program of Modernism, that painting is nothing other than itself, Magritte used literalism to undermine itself. He played with “resemblance” as the primary reference that prescribes and classes: copies on the basis of mimetic relation to itself and “similitude” in which there is on reference, the anchor is gone. With similitude, the relations are lateral with infinite and reversible relation of “the similar to the similar” in an endless series of repetitions. The concepts of resemblance and similitude are familiar to those who have read The Order of Things and belong to the old episteme. 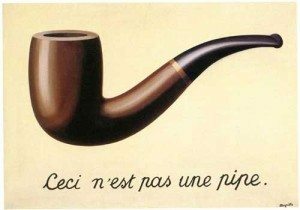 According to Foucault, what renders Magritte’s figure “strange” is not the contradiction between the image (the pipe) and the text (“This is not a pipe”) because a contradiction can exist only between two statements. In La trahison des images, there is only one statement and one simple demonstration but, through our own habits of reading, we assume a “natural” connecting of text and drawing. Foucault attempted to correct this misreading. Rather than reading the painting as a sign with its label, Foucault asserted that Magritte’s painting was a calligram, “secretly constructed and carefully unraveled.” According to Foucault, a calligram augments the alphabet and repeats without the aide of rhetoric, trapping things in a double cipher. The calligram brings text and shape as close together as possible: the lines delineate the form of an object and arrange sequences of letters, lodging statements in the space of a shape. A calligram makes the text say what the drawing represents and distributes writing in a non-neutral space. The ideogram is forced to arrange itself according to the laws of simultaneous form. Thus La trahison des images is tautological in opposition to rhetorical, which is allegorical, rich, and full. The calligram uses letters to signify both as linear elements arranged in space and as signs in a unique chain of sound. The calligram effaces the showing and naming opposition and creates a trap of double function: the signs invoke the very thing of which they speak. Between words and objects one can create new relations and specify characteristics of language and objects generally ignored in everyday life…Sometimes the name of an object takes the place of an image. A word can take the place of an object in reality. An image can take the place of a word in a proposition. Words are not bound directly to other pictorial elements, and, as Foucault wrote,“Magritte allows the old space of representation to rule, but only the surface, no more than a polished stone, bearing words and shapes: beneath, nothing. It is a gravestone.” By the end of the Seventies, Foucault and Barthes had brought together a number of ideas borrowed from their precursors and had extracted fragments for fuller examination. This pluralism in philosophical thought was exemplified by Magritte’s critique of Plato and the date of his death in 1967 marked the beginning of Postmodernism. The late works of Magritte coincide with American interest in the late works of Ludwig Wittgenstein (1889-1951) as seen in the works of Jasper Johns. In False Start (1963), Johns, mockingly pointed different areas of color in the “style” of Abstract Expressionism” and then, using the universal style of the stenciled label, proceeded to (re)name all the colors. “Red” was stenciled in yellow floated on top of an area of blue paint. The Name and the Thing were disconnected, indicating Wittgenstein’s concern with pointing, the basis of the proposition. The proposition that “red is red” is undermined by disconnecting the expected link between the object and its label. The ultimate “point” of the exercise is that our “reality” is linguistic and rests upon our naïve belief that our words have an inherent meaning. Wittgenstein warned that meaning does not exist in and of itself but only “in the use,” a point that both Magritte and Foucault were making in other words and in other ways.